I’m explaining to him that petit fours are little cakes with icing poured over them. About this big (imagine my hands making the universal 2 inch square symbol). And he goes, “Oh! They sell those at Whole Foods.” Me: “WHAT? ?” See, I have searched the internets more times than I care to mention trying to find petit fours in Seattle, and he’s telling me I overlooked Whole Foods. I would have hopped in the car immediately, but it was well past Whole Foods’ closing time. Ok, maybe not, but I was already in pajamas. So the next day I set out for Whole Foods in Ravenna, giddy because I was moments away from petit four bliss. As I perused the bakery case, I encountered lots of lovely, lovely baked goods, but nary a petit four in sight. I made no less than three trips around the entire bakery area. No petit fours ANYWHERE. What they did have, though, were a ton of yummy looking bite-sized desserts. The price was a foreboding $18.99 a pound, but then how much could these really weigh? I got a tiny key lime pie and a wee cheesecake and they worked out to about two bucks each. Yes, a little steep for bite sized dessert, but you’d just have to see how cute these things are. The next day, I was near another Whole Foods. Ok, it was maybe three miles out of the way, but who’s counting? Again, no petit fours. Ack!! I tell her about my wild petit four chase and tell her we’ve GOT to get petit fours when I go down to Memphis to help attend to the baby for whom she was recently showered. Fast forward to me in Memphis. I got the name of the petit four place from Jenna’s friend Tricia. I found their website, which was…somewhat off-putting. Some of their cakes were worthy of Cakewrecks. I would love to link to the site, but now Google warns that the site might harm my (or your) computer. 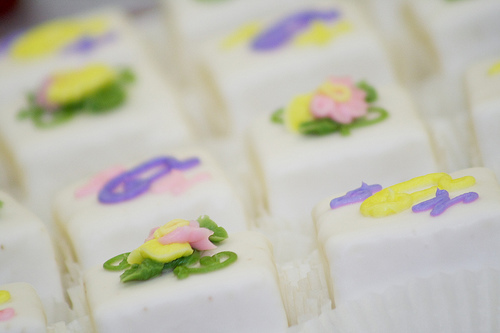 Nevertheless, Jenna and Tricia vouched for the deliciousness of the Kay Bakery petit fours, so I ordered a dozen. Ok, a dozen and a half because I was determined to bring some home to show Geoff. Not for him to TASTE, mind you, because I knew he would hate them. If the website put me off, the actual bakery did not do much to assuage my misgivings. But the guy showed me the petit fours, and while they weren’t exactly square, I could tell right away that they were honest-to-God petit fours. Hallelujah! And they were as good as promised. Yay! Some folks have no appreciation for the finer things in life. Where’s your favorite placeto get petit fours? Have you ever attempted to make them yourself? Ha! I also believe that petit fours should have pastel frosting. Preferably little layers inside, too, with some contrasting cream frosting in between. Mmmmm… Now you have this Northern girl fantasizing about petit fours! I’m partial to the white frosting, but I wouldn’t kick a pastel-colored one of my plate!! I have wonderful memories of petit fours!! Highschool graduation tea, deb lunches and preference night in college. I had no idea petit fours were a southern thing I figured everyone had them! If you ever find yourself in Fort Worth, Texas, you must try the petit fours at McKinley’s Bakery…they’re perfectly square and have a layer of apricot preserves in the middle. Heaven. Petit Fours are not just southern and not just American. I’ve a Good Housekeeping Picture Cookery book published in 1950 that has a recipe for them and they’ve always been popular here in the UK. Give me a yell if you want the recipe! I would love a recipe for them. I’ve been frightened by all the ones I find on the Internet that include 7 cups of powdered sugar for the icing. Petit Fours are not just cake. There are several categories of Petit Fours, and they are all French, hence the French words Petit Fours (which translates to ” small oven” as a descriptor of the low heat required to cook the small cakes. 1. Petits fours secs (sec meaning “dry”) include a variety of small desserts, such as special dainty biscuits, baked meringues, macarons, and puff pastries. 2. 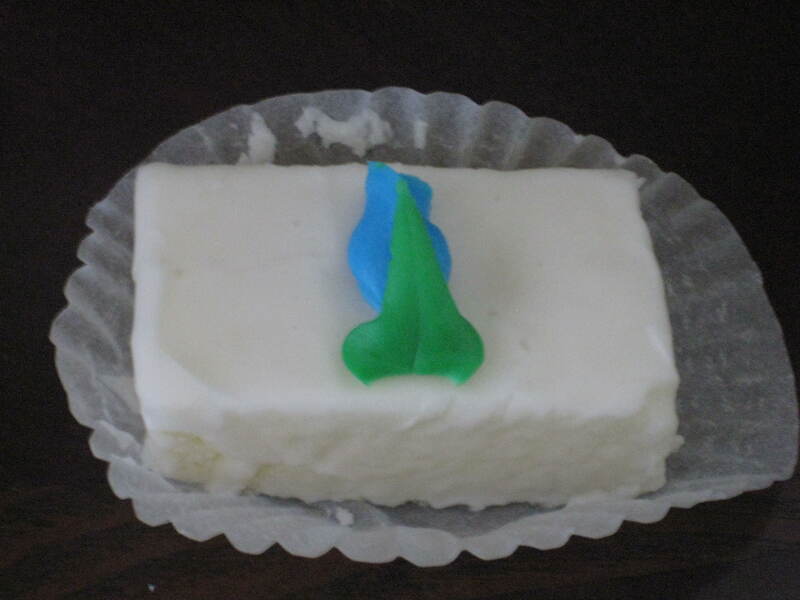 Petits fours glacés (glacé meaning “iced”) are iced or decorated in some way, such as tiny cakes covered in fondant or glacé icing, small éclairs, and tartlets. In a French patisserie, assorted small desserts are usually called mignardises, while hard, buttery biscuits are called petit fours. 3. There are also petits fours salés (salé meaning “salted” or “savoury”), which are bite-sized salted appetizers usually served as part of cocktail parties or buffets. Sorry, I guess folks on the Internets can’t tell when my tongue is planted firmly in cheek. I am aware of the existence of the wide variety of petit fours that exist in the world. But it seems that one can’t find anything resembling the southern interpretation of petit fours (small cakes with poured on icing) outside the south. I am actually making petit fours right now for my daughter’s Kindergarten class. And you are so right I finally decided to make my own because you really can’t find them anywhere these days.